Heat oven to 425°F. Spray bottoms only of 12 regular-size muffin cups with cooking spray. In medium bowl, mix Bisquick mix, cheese and 1/2 cup of the milk until soft dough forms. In large bowl, beat eggs, remaining 1/4 cup milk and the pepper until well blended. In 10-inch nonstick skillet, melt butter over medium heat. Add egg mixture; cook 3 to 4 minutes, stirring occasionally, until firm but still moist. Fold in pasta sauce and bacon until blended. 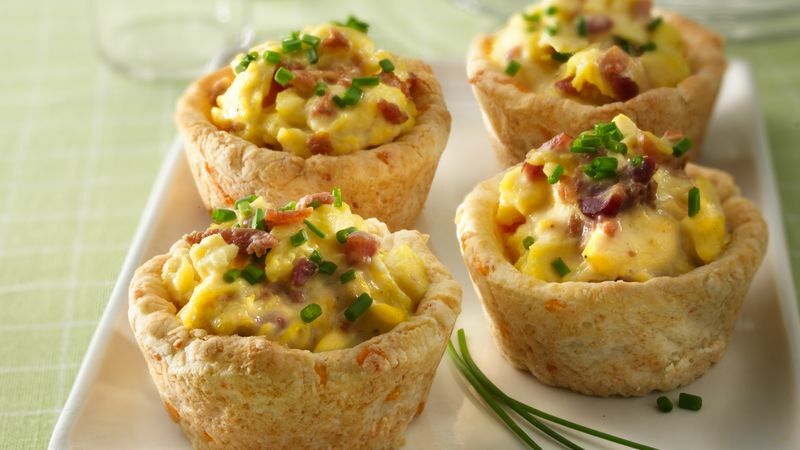 Biscuit cups can be baked the day before and stored in an airtight container at room temperature. Just fill with scrambled eggs and serve.